Step aside Mr. Slater. Caroline Marks coming through. Late Sunday night, surfing fans across America tuned in to watch Marks win the World Surf League’s season-opening Boost Mobile Pro Gold Coast event in Queensland, Australia, claiming the $100,000 prize. It was the first major surfing event to award equal prize money to female and male competitors. 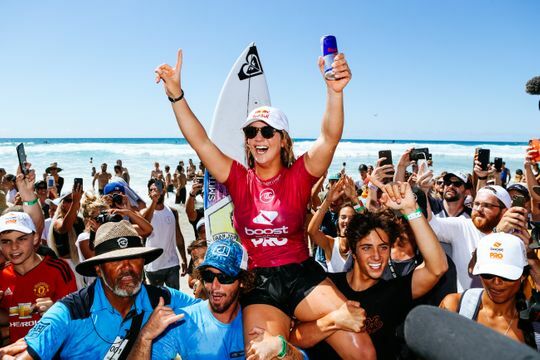 The youngest, at 15, to ever qualify for a major surfing tour, Marks had stunned the surfing world a year ago by finishing seventh in the final world rankings. This year’s final tour rankings will go a long way to determining spots on the rosters for the Tokyo Games in 2020, when surfing will make its Olympic debut. It was Marks’ fourth career win, coming on the heels of her second straight Florida Pro title at Sebastian Inlet, just a few miles from where she grew up. She also has won in Los Cabos, Mexico. Marks, who defeated her “hero,” Carissa Moore of Hawaii, 13.83-11.67 in the final, had earlier defeated seven-time world champion Stephanie Gilmore of Australia in the quarterfinals. “I was actually laughing because the first time I came to this event I was in the trials and I just lost in the first heat every single time, so to now win the event is amazing,” said Marks, who was in Cocoa Beach late last year to get a glimpse of her sand sculpture in front of the famed Ron Jon Surf Shop. Marks’ family now splits their time between New Smyrna Beach and San Juan Capistrano, California. “I told her one time that by 16 or 17 she could qualify for sure, and that happened, and to just keep doing what she’s doing,” said Taylor, a Satellite Beach native who coached Marks as young as 10 and competed on the World Qualifying Series for 12 years. Part of Marks’ family was on hand in Australia, including dad, Darren, and brothers Luke and Jack. “I’m really excited to get to the next event and hopefully get on a roll,” said Marks, who will be heading to the Rip Curl Pro Bells Beach event in Australia, April 17-27. Meanwhile, Slater, considered “the greatest surfer in history,” got off to a rough start in what could be his final full season on the men’s tour, which he last won in 2011. Now, in his 27th season, at age 47, he lost out in two straight heats during the Quiksilver Pro Gold Coast, won by Brazil’s Italo Ferreira at the same venue. Now, the attention turns to Marks. “I can’t wait to see where this result will take me this year,” she said.